I’m amazed at how far afield young folks today travel before they reach the age of thirty. A few weeks ago, the daughter of a good friend who lives in New Iberia, Louisiana, telephoned that she was in Sewanee, visiting her alma mater, the University of the South, and wanted to come by for a visit. Jennifer Desormeaux received her first degree in Art from the University here and was only a few weeks away from getting her M.F.A. from the University of Georgia when she visited with me for several hours before driving back to Athens. Jennifer began traveling abroad when she attended the Episcopal School of Acadiana in Cade, Louisiana and took her senior trip across the pond to Europe. I’m sure she must have repeated an experience abroad while she attended the University of the South, and while studying at Athens, she participated in a University of Georgia camp in Monteverde, Costa Rica where she taught Digital Photography. Jennifer had returned to Sewanee to pick up photographs she exhibited at Sterlings Restaurant, an exhibit that included winter landscapes. While talking about her art, she told me that she believes her “body is the tool to make a mark,” not just physically but to inspire the marks she makes in photographing what she sees. She has completed two marathons (one in Eugene, Oregon, and a Marathon is twenty-one miles each, folks) and has the slender, fit physique of an athlete. Jennifer came over to invite me to assist as deacon and to deliver the homily at her marriage to Andy Graycheck who is getting his degree in Landscape Architecture when Jennifer receives her M.F.A. However, before she marries in October on Jefferson Island (near New Iberia) and settles in Iberia Parish, she’s off to Australia to teach photography for a South Pacific Abroad program! Now, you can more closely relate to my opening statement about how far afield young people travel nowadays! Jennifer’s fiancé, Andy, not to be outdone by his traveling bride-to-be, has traveled and studied the cultivation of bamboo in India and is interested in sustainability. He’ll have an opportunity to view some of the oldest bamboo in the U.S. growing on Avery Island, Louisiana, just down the road from New Iberia, where E.A. McIlhenny, founder of Tabasco hot sauce, cultivated Moso bamboo from Japan. These bamboo groves on the island still flourish, and bamboo enthusiasts helped celebrate the 100th anniversary of the groves in February of this year. An interesting paper about the deceased McIlhenny entitled “E.A McIlhenny, Pioneer Bamboo Planter,” was written by Andrew Ringle, a cousin of the late E.A. 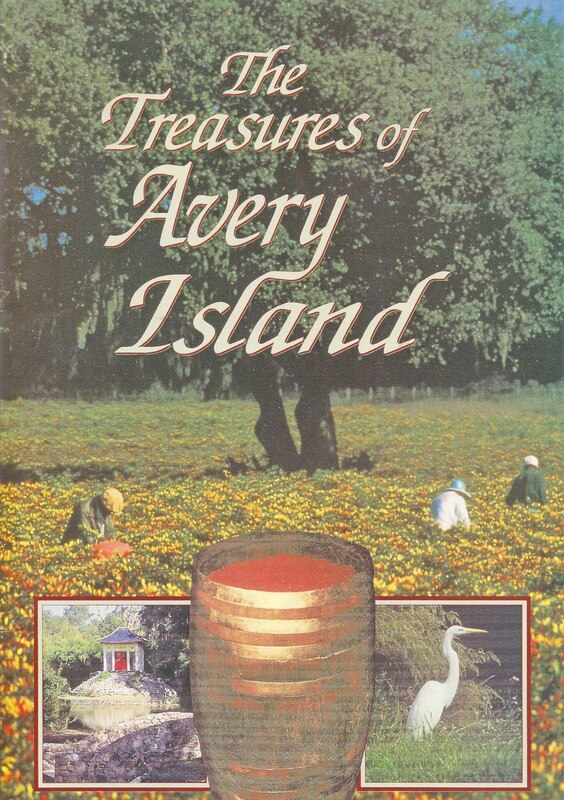 McIlhenny who lives on Avery Island. The paper focuses on the correspondence between McIlhenny and the plant explorer David Fairchild and his colleagues at the U.S.D.A.’s Office of Seed and Plant Introduction and can be found on the internet. I know Andy and received support for the work of Solomon House from him when I served as Executive Director of this outreach mission. His charitable efforts are as impressive as his scholarly and well-written paper about the bamboo groves that he grew up next to on the island. Andy Graycheck, Jennifer’s “intended,” is interested in bamboo as a sustainable choice for building supply. It’s the fastest growing woody plant in the world and has better tensile and compression strength than steel! It can be harvested in one-five years and absorbs carbon dioxide, releasing thirty-five percent more oxygen into the air than an equal stand of hardwoods. It’s used in paper, flooring, furniture, building materials (especially fences), and its fibers are a lot stronger than wood fiber. Bonuses for bamboo growers: no agricultural chemicals needed for it to thrive, and the roots of bamboo stay in place after harvesting, preventing erosion. I think Andy is in for good bamboo viewing at Avery Island where McIlhenny cultivated sixty-four varieties during his lifetime. He’ll also get a look at an area lush with azaleas, irises, camellias, Chinese and Japanese wisteria, hedges of Oriental holly, and lotus and papyrus imported from the Nile. They are contained within Jungle Gardens, a 200-acre garden where McIlhenny achieved a design of color and symmetry that has made the gardens as well-known as the red peppers of the Tabasco sauce enterprise. Well, from traveling brides-to-be to bamboo is a long stretch, but that’s what happens nowadays when you welcome an educated young person over to engage in repartee’. Note: For further reading about Avery Island, amazon.com stocks copies of my book, THE TREASURES OF AVERY ISLAND , published by Acadian House Publishing in Lafayette, Louisiana. Several days ago, I went to a High Tea given for volunteers who have agreed to sell tickets and merchandise at the various Sewanee Music Festival events where I signed up to help at two concerts. At the tea, I met several people I’ve often seen about town but to whom I had never been formally introduced. One of those people was Sally McCrady Hubbard, an administrator who works with the Festival each year and who has a glorious voice, according to some of the attending volunteers. Sally, a graduate of Sweet Briar and Tulane University, once served as Associate Editor of Studies in English Literature: 1500-1900 at Rice University. While talking with her, I was delighted to discover that she had once been in a poetry group with one of my favorite poets, Vassar Miller. That’s the way of Sewanee–no matter where you go or what organization you join, a connection is made with someone you know or admire. In the case of Vassar Miller , I shared with Sally that I had quoted this poet in several sermons. I had been drawn to Miller‘s work when her collection, IF I HAD WHEELS OR LOVE, was reviewed in an Episcopal periodical several years ago. 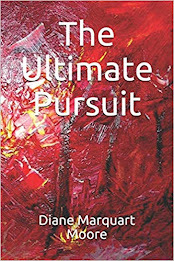 Her intense religious experiences are fully expressed in poems included in this volume, and her work reaches the brink of mystical writing–she reminds me of the famous Anglican mystic, Evelyn Underhill. Miller’s life is a witness to miracle. She was born in Houston, Texas and was severely handicapped by cerebral palsy at birth. However, she began writing as a child and was encouraged by her father who brought home from his office a typewriter that she used to record her first poems. Her stepmother, who also taught her to read and write, supported her to attend public schools. Miller was not only courageous, she was tenacious and attended the University of Houston in Houston, Texas, earning her B.S. and M.A. degrees. Later, she taught Creative Writing at a private academy in Houston. Always, even when traveling, she wrote poetry. Her work was nominated for the Pulitzer Prize in 1961, and in addition to her own poetry, she published DESPITE THIS FLESH , an anthology of stories and poetry about the severely disabled. Miller’s religious beliefs were sometimes tested with pain, but her poetry that describes this pain and suffering is not mawkish. As Sally Hubbard said to me, “she had a voice.” At first reading, her poignant poems resonated with me and, as I said, I quoted from her work in several sermons, the most notable lines derived from “To Jesus On Easter,” which speak of her perceived likeness to Christ: “Yet I can trust you./ You resembling me–/two eyes, two hands, two feet,/five senses and no more–/will cup my being,/ spilling toward nothingness, within your palm./and when the last bridge breaks,/I shall walk on the bright span of your breath.” Witness the faith of the handicapped! *Title of the collected poems of Vassar Miller, with an introduction by George Garrett. The most commonly-held belief about guardian angels being assigned to watch every individual originated in Greek thought and is derived from Zoroastrianism. The belief is also alluded to in Judaism: in the passage in which God says to Moses: “my angel shall go before thee.” In Acts 12:12-15 another allusion is made to the belief that a certain angel is assigned to protect each individual when Peter was escorted from prison by an angel. In Zoroastrianism, angels sometimes volunteer to descend to earth to stand by individuals throughout their lives. When I was compiling the book, MEDITATIONS OF MY HEART, written by members of the women’s writing group at the Church of Epiphany in New Iberia, my friend Vickie contributed a story about her guardian angel. She wrote: “An angel of which I was unaware saved my life. Several years ago, while teaching at ULL, I began to feel very uncomfortable and had a nagging pain in my side that I had ignored for some time (angel’s first intervention). I called my doctor who responded with alarm and scheduled me to see him that afternoon. After examinations and tests, he found uterine fibroids that had grown quite large and were crowding other organs. This accounted for the pain. The doctor suggested several courses of action: 1) wait for full-blown menopause); 2) undergo a hysterectomy; and 3) schedule a D and C operation. I opted out of waiting and chose a D and C, knowing that the situation would be temporary and more than one procedure would be necessary. Prior to that procedure the doctor scheduled a CA125 (blood test for ovarian cancer) and a sonogram. Only then would he feel 99 percent certain that I had no undiscovered problems and would be safe not having the hysterectomy. Meanwhile, I began to feel strongly that I did not want a temporary solution, but wanted to get rid of the problem (angel’s second message). So even though the tests were favorable, I called the doctor back to schedule an operation. My decision was made in the face of publicity about doctors doing too many hysterectomies and a friend (who had battled the same problem and won) sending me scary literature, not to mention my terror of anesthesia. Whether you believe or disbelieve in angels, the fact remains that sixty-eight percent of the people in the U.S. do believe in these ethereal beings. Note: This angel, rendered by Paul Schexnayder for MEDITATIONS OF MY HEART, is a boy angel. Yesterday I lunched with good friend Isabel Anders, author of BECOMING FLAME, and we covered a wide range of lunch table topics, including one about angels. I’m one of those people on the side of belief in angels and I seem to be in good company – sixty-eight percent of Americans believe in angels, mostly guardian angels. In 1996 when I coordinated a women’s writing group for The Church of the Epiphany, I reviewed many spiritual books, then asked the women to respond to the lecture on the book in writing in twenty minutes or so. Later, they read them aloud to the group. I collected these responses and published a small book entitled MEDITATIONS OF MY HEART to sell to other church members. One of the books I reviewed was Sophie Burnham’s A BOOK OF ANGELS, in which she wrote that “we know nothing of the realm of angels but we are given brief, fleeting glimpses in our hearts and hear them singing in lost memories. We see it at the edge of our eye, but so ephemerally that when we turn to face it, it’s already gone.” I quote this from Sophie’s book with permission given by Random House to publish in MEDITATIONS OF MY HEART. in the wars of our broken world. unwilling to participate in unhappiness. like our thoughts, cannot be seen. and shared the bread of insight with him. winged past, flying to higher states. bring beauty and light eternally. that are awesome and credulous. waiting to entertain them unaware. Note: The illustration was drawn by Paul Schexnayder for MEDITATIONS OF MY HEART. While I was in New Iberia this winter, Paul Schexnayder and I began to pursue an idea to do a book about Episcopal Church altars in the Diocese of Western Louisiana. Paul is a wonderful artist who owns a small gallery called A&E Gallery on St. Peter Street in New Iberia and has done the covers for several of my young adult books. My call is to write prose poems about ten churches and their altars, and Paul will do paintings of the church exteriors, as well as the altars within the structures. My first church to research was the church that raised me up to be a deacon, The Episcopal Church of the Epiphany in New Iberia, and the second research involved the Mt. 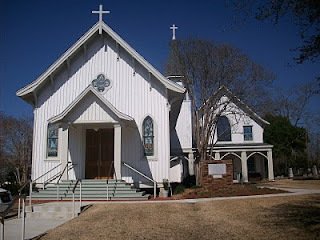 Olivet Episcopal Chapel in Pineville, Louisiana, next to the diocesan offices. A few days before I left New Iberia, we traveled to Pineville and were able to make a grand tour of the restored chapel and the diocesan house with the Rt. Rev. Bruce MacPherson, bishop of the Diocese of Western Louisiana, and his wife, Susan. Susan was a principal guiding force behind the restoration of Mt. Olivet and greeted me with an armload of research material about this chapel. The restoration of the chapel is impeccable, and is a tribute to the Bishop’s and Susan’s vision for this important historic structure in the Diocese. The preservation and maintenance of the chapel was provided through the generosity of the Hardtner/Blake Foundation. Over lunch, we discussed the book that Paul and I will work on during the coming year, and the Bishop agreed to write an introduction on church altars for WELCOME TO THE TABLE. Mt. Olivet, pictured above, was featured on the cover of the 2010 Historic Episcopal Churches Engagement Calendar published by the National Episcopal Historians and Archivists in Swarthmore, Pennsylvania, and a short vignette about it appears on the March page of the calendar. The chapel was built under the leadership of Bishop Leonidas Polk , first bishop of Louisiana, who was known as the “fighting bishop,” as he served in the War Between the States and died in battle in 1864. 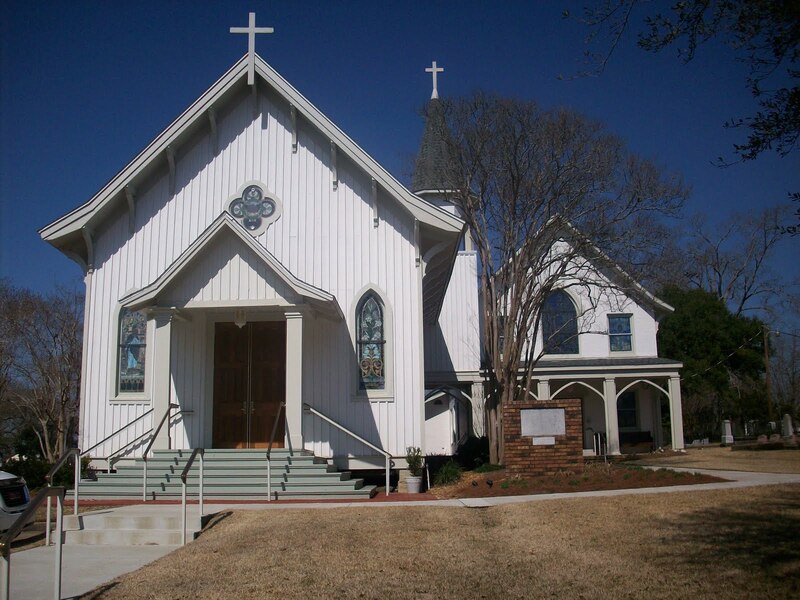 Through the inspiration of women of St. James Episcopal Church in Alexandria, who ferried across the Red River to teach Sunday School classes, money was raised to build the chapel in 1857. The Gothic architecture building, designed by Richard Upjohn, was constructed of milled pine, except for the oak floors, and a pair of brass coal-oil chandeliers were hung from the vaulted ceiling. The exterior was built with board and batten siding and Gothic windows. Today, all fourteen openings in the chapel contain stained glass windows, ranging from the quatrefoil over the front entrance door to the chancel window behind the altar that depicts Jesus standing at the open tomb with staff in hand. In 1979 when the Diocese of Louisiana was divided into two dioceses, The Rt. Rev. Willis Henton, the Diocese of Western Louisiana’s first bishop, made Mt. Olivet the bishop’s chapel, and the parish house became the diocesan offices. The Rt. Rev. Robert Hargrove (who ordained me) attempted to restore Mt. Olivet and parish house during his episcopate, but funds for the restoration were not available. 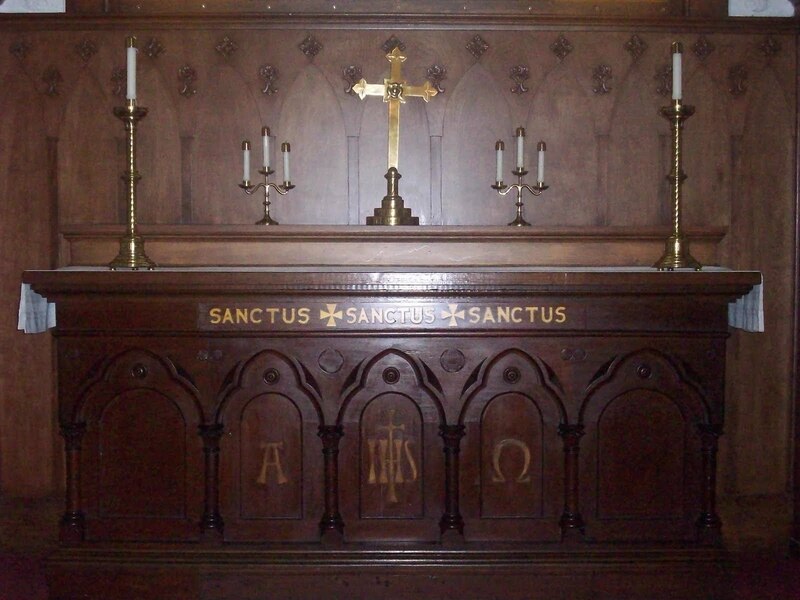 However, in 2006, Bishop MacPherson received a large donation to restore the little chapel. Restoration was completed in 2009, and services in the chapel are now held weekly. Paul and I hope to visit more western Louisiana churches this Fall, and we’re excited about this historic church project that represents the vision and commitment of Episcopal church men and women during the past two centuries. During the fall of 1989, I was selected to be a member of a Creative Writing class taught by Ernest J. Gaines, a renowned writer of southern literature who was then Writer-in-Residence at the University of Louisiana at Lafayette in Lafayette, Louisiana. I was a writer in a group dominated by graduate students who hadn’t learned very much about the art of criticizing constructively their classmates’ works in progress, and I endured a not-so-good time listening to the various criticisms, which sometimes bordered on mean-spiritedness. On the other hand, Ernie Gaines was a kind and constructive critic who gently led us through our short stories with a firm hand and a wry sense of humor, advising at every turn of phrase to “practice, practice, practice,” and “revise, revise, revise.” I left the class with an A and a polished short story that had been debunked by all the students but blessed by Ernest Gaines. A few years later, the story appeared in a literary magazine published by Xavier University in New Orleans. Ernie Gaines, the consummate storyteller, inspired me to continue working on my craft and gave me two good writing rules to follow: “believe in your work,” and “revise, revise, revise.” He has been honored many times since that fall class he selected me to be a member of the class of struggling writers. Several months ago, I received a notice that University of Louisiana Lafayette is honoring Ernie Gaines by building an international Center for Scholarship on Ernest Gaines and his work. The Center will provide a space for scholars and students to work with Gaines papers and manuscripts. It will expand the collection on Gaines to include all books, journal articles, interviews, theses, and dissertations on his writings. The complete collection of published translations of Gaines’s writings will also be included. Another program of note to be sponsored by the Center is the Ernest J. Gaines Speakers and Writers Series that will bring major scholars and writers to ULL. Perhaps the Series will challenge the Sewanee Writers Conference held each year on the University of the South campus! The Ernest Gaines Center is located on the third floor of Edith Garland Dupre Library, and programs will be offered as contributions to support them are donated. The director of the Gaines Center, Dr. Marcia Gaudet, wrote the definitive biography of Ernest Gaines. I visualize the Center as one that resembles the Tennessee Williams Center here at Sewanee where drama programs abound. In 1983, Tennessee Williams left his literary rights to the University of the South and royalties helped build the Tennessee Williams Center, a performance and teaching facility. This Center also provides Tennessee Williams teaching fellowships that bring renowned people involved in the Arts to the campus. How heady it is to live in the literary atmosphere created by both of these outstanding writers each year! Spring is everywhere. I have seen it as we traveled on two missions of mercy, moving through Louisiana, Mississippi, Alabama, Georgia, and Florida. On Good Friday, I sat in a rocker on the long porch of Inez Sullivan’s home in Frostproof, Florida and got acquainted with a flower I had never seen blooming – the Bird of Paradise flower, which is sometimes called the Crane flower. It’s a plant native to South Africa but has been cultivated in this country and loves warm spring temps of 65-70 degrees during the day but tolerates temps no lower than 50 degrees at night. It thrives in Florida and California where sunny days are abundant. 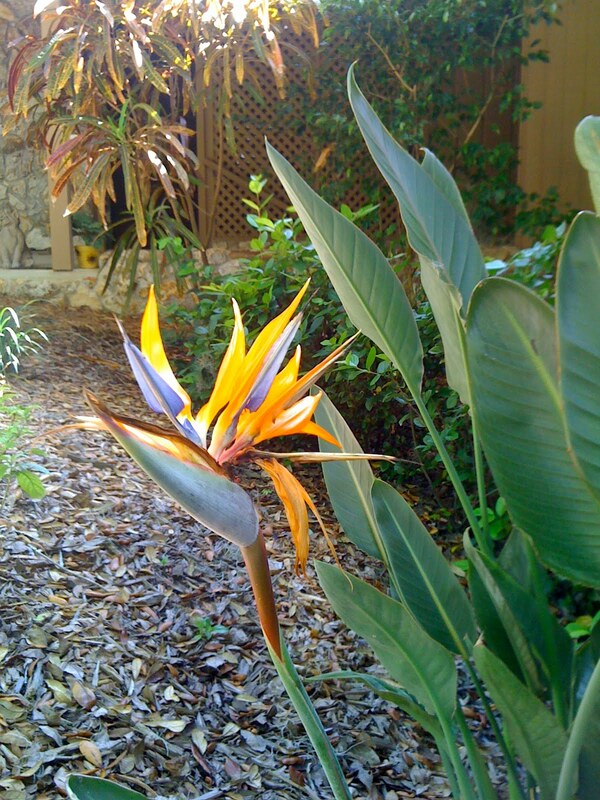 The Bird of Paradise also grows close to the ocean in gardens planted beside seaside homes where its leaves are able to withstand salt breezes. 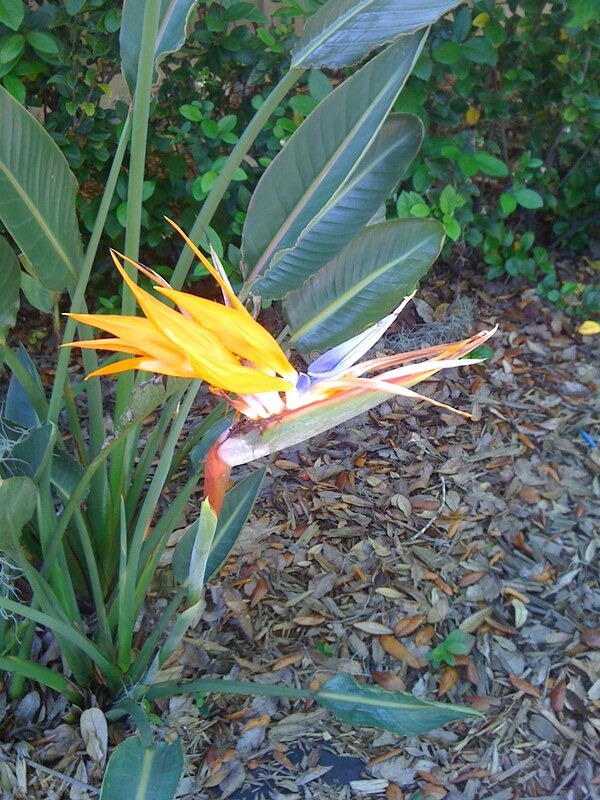 When I first glimpsed the plant, I thought of the old roadrunner cartoons, as it resembles a bird with its long stem, petals of bright orange and a blue arrow-shaped tongue. Actually, the flower looks like a brilliantly-colored bird that has landed on a plant with bluish colored-green leaves. This Bird of Paradise had been planted by my friend Vickie’s mother who has been too ill to see it in bloom, but as we were leaving, her caretaker promised to take her out on the porch to see the product of her very green thumb. On the way back to Sewanee, Tennessee, we stopped in Macon, Georgia where a Cherry Blossom Festival had just taken place. The medians on highways around Macon are filled with the trees which originated on the lawn of William A. Fickling who first glimpsed this mystery tree on his lawn in Macon in 1852. He discovered that it was the Yoshino (flowering) cherry tree, which is native to Japan, but never found out how it arrived on a lawn in the heart of redneck country! Fickling learned to propagate the trees and distributed them throughout Macon. Today, the Yoshino cherry trees in Macon Georgia number 200,000. Every year the Cherry Blossom Festival carries the theme of love, beauty, and international friendship and is complete with bands, costumed performers, hot air balloons and world class food featured at the International Food Fair. We had just missed the festivities but were happy to get a glimpse of the trees in full bloom. In Monroe County of Georgia, we passed white blooming pear trees and wisteria vines entwined among tree tops, redbuds in the woods, and enjoyed the full resurrection of Easter flowers. However, the sights that stirred us most were the gates of Sewanee and the Spring in the woods that had happened in our absence. The woods are now filled with yellow and white daffodils, forsythia, and redbuds, and we await the awakening of dogwood. 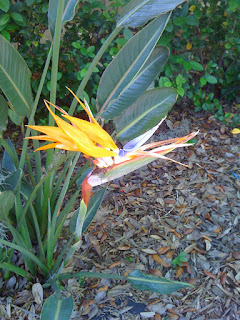 We have our own birds of paradise! Years ago, I visited Natchez, Mississippi for the fifth or sixth time and picked up a book describing an unsolved murder that had occurred there during the early 1930’s. 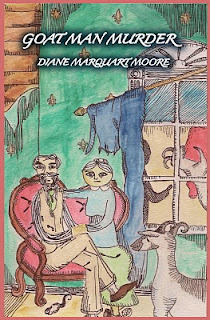 I was so intrigued that I returned to New Iberia, Louisiana and began sketching out a fictional account of the murder. That story simmered at least twenty years before I finally decided to flesh out the manuscript and produce GOAT MAN MURDER. 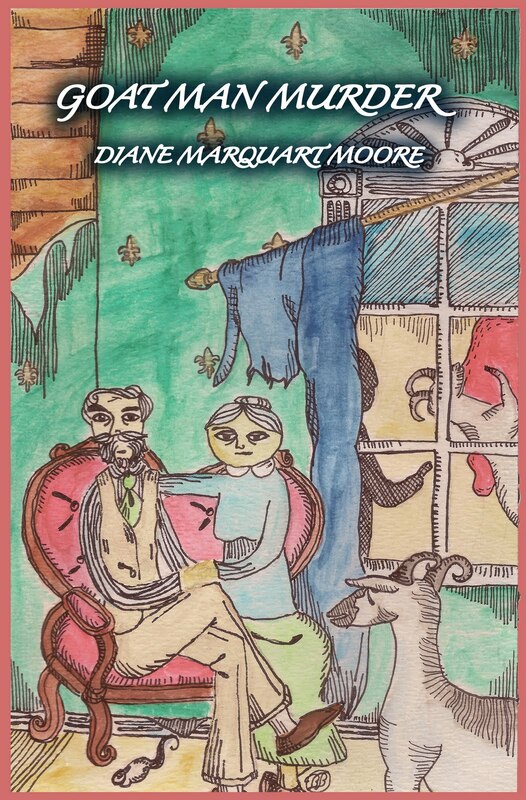 In this story, Miss Josephine Meredith, a stingy spinster living in Natchez, MS, is visited by her first cousin, Donald Majors, every night, for over twenty years in her home, Meredith Manor. She seems to live in a “time warp” of the 1890’s when Natchez was more affluent and her father, a diplomat, scheduled grand balls in her honor and took her abroad to dance at St. James Court in England. When Miss Meredith is found, feet up, in the brush between Glendarrow and Meredith Manor, Jonathan and Miss Livy become prime suspects. But so is Penelope, Donald Majors’ eccentric sister who spends days floating around in a white peignoir in the cupola of their home contemplating suicide because Donald loves Miss Meredith. Law officers in Pine Bluff, Arkansas turn up the weapon and body of “Old Tin,” a black man who worked for Miss Meredith. Everything points to Old Tin as the murderer. Jonathan and Miss Livy are released from jail, but Jonathan goes beserk and is confined to an asylum where he confesses that he not only killed his father, The Rev. Darrow, he hired Old Tin to murder Miss Josephine. However, Donald also makes this claim and jumps to his death from Penelope’s cupola. Penelope joins Jonathan in the asylum and falls in love with her psychiatrist, Dr. Redding. Redding wonders who really killed Miss Josephine, and so will readers of this unsolved murder based on an actual crime that took place in Natchez, MS in the 1930’s. Ben Blanchard, my young artist friend, did a watercolor for the cover of GOAT MAN MURDER, shown above, and my grandson, Martin Romero, tweaked the painting and designed front and back covers of the book. This mystery should be available on amazon.com later this month.